Fighting Irish Thomas: Barack Hussein Obama: The Greatest Liar Ever? Barack Hussein Obama: The Greatest Liar Ever? "Can a poem or a song defeat a tyrant?" Defeat a killer, defeat atrocities, defeat the bottom falling out of the universe when you least expect it? "Yes, Yes, it can, given enough time. When a work of art is both beautiful and true, man's freedom is strengthened by it—both his interior need for freedom and his capacity to seek a rational understanding of it." "You hope for a lot." "Yes, I hope for it. And if I didn't, I would die of despair." "You are a person of extremes," Josip says, not unkindly. "Am I? I suppose so. But which is more extreme, a man who desires to speak the truth in a season of lies or a tyrant who creates the lies that engulf an entire people?" He wandered into our world with a whisper, an unassuming community organizer of modest means from humble beginnings ... or so his ghost-written life story would have us believe. 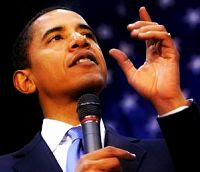 But one rousing speech and two best sellers later, aided largely by an infamous (if gutless) American terrorist, a white-hating, black-baiting preacher, and one of the sleaziest political insiders the Windy-City-on-the-take has ever known, this mystery man now stands on the precipice of the Presidency of the United States. His talking points have mesmerized millions, and his talking heads have shielded the general public (at least the public that doesn't read Republican or Right-to-Life blogs or view EWTN or Fox News!) from any inconvenient Barack facts that might interfere with his New Age messianic mantra. But fortunately there are a few who still remember Truth, and haven't given up the fight to get it back. But who is Senator Obama? Is he really the sensational savior of the downtrodden or the supreme socialist who will capture not only the imagination, but the wills of the entire world? To answer the article's opening question, he is not our nation's greatest liar ... yet. Certainly, his utter stumbling with Rick Warren's when does life begin question ("It's above my pay grade"?) or his contemptible people clinging to the guns and religion comment proves Barack is still human. But if Obama is a master orator, he is also a quick study, for not only has his mindless mouthings such as "Tax cuts for 95% of the people!" (an utter impossibility since only about 60% actually pay taxes!) and smooth distortions of Senator McCain's record been presented so pleasantly, that much of the populace has been duped, but his blatant lies about his stances on issues in the last debate (most notably his pro-abortion voting record), has convinced me the man is not only dangerous, but diabolical. Like the character in Mr. O'Brien's latest novel (who incidentally was fighting socialist repression under Tito), you might argue I am a person of extremes. Indeed much of the muck about Barack can't be proven, for the mainstream media has refused to focus on Obama's socialist contradictions, and the Ayers/ Wright/ Rezko connections have been virtually silenced. Even Barack's birth certificate (which allegedly will prove he was not a native-born citizen and thus ineligible for the presidency!) has been sealed, and the press has made nary a peep about it. But make no mistake. Not only will Obama's election make "choice" the law of the land, his socialist leanings will follow the Sanger/China logical progression to the point abortion (and later sterilization) will literally be forced upon the less fortunate. That is why, only one week from the election, when the defeat seems inevitable, I, with the help of St. Jude, today's saint as well as the patron for lost causes, fight on, in hopes a few may change their minds about Obama's mind-blowing change. For while I don't agree with the majority of Republicans that socialism is always to be feared (read the Acts of the Apostles), godless socialism must be, and I can guarantee a master plan that not only involves controlling the country's wealth, but killing the nation's old and young while demeaning the meaning of marriage is NOT from God. The Republicans would NEVER allow Roe v Wade to be overturned...NEVER...because it's the only thing that motivates the crazy church people to go to the polls to vote. The Republican party is using the uber-religious so that they can stay in power and get richer and richer. Christians never participated in elections before the late 1970s. They felt it was beneath their faith. Wish they'd go back to that philosophy. Your prayers to St. Jude avail nothing. There is no one up there listening to you. There is no God and deep down, you KNOW this. You're full of doubt. That's why you're so hateful and spiteful in your blogging - you're a moth throwing yourself repeatedly against a lightbulb that you so desperately want to be God; having to re-convince yourself everyday of your relevance and importance in a vast, vast universe. Give in to your doubt, realize the TRUTH, that there IS NO GOD, there never was anyone named Jesus EVER (it's a story copied over and over for the last 10K years, see Egyptian story of Horus) and be free! anonymous, Oct. 28, 6:31 p.m. -- To deny Jesus was an historical figure when even non-Christian historians wrote detailed accounts about Him -- is exactly what all "great" dictators do, rewrite history and take out the parts they don't like. I advise you to look at some Christian miracles -- (which even hard-core athiests can't explain) starting with the shroud of Our Lady of Guadalupe (which helped convert millions to Christ), and see if you can look at the event and evidence and still deny something supernatural is going on. Your view on abortion not only lacks compassion for murdered babies, but again takes no account of the truly heroic sacrifices many Christians have made not only for the unborn, but the elderly, the poor, those with special needs -- and yes, even those who deny Christ. And, yes, I will pray for you, that a true Christian comes into your life and you discover the difference between a true believer and the cardboard cutout you have created to justify your bile.